What would you do without the convenience of your sink and toilet? Disposing of human waste can pose serious public health problems when sewer or water systems are not working. With some preplanning, you can assemble supplies to get your family through a disaster without risking contamination. Commercial reuse of plastic buckets for food is illegal, so supermarkets, restaurants and bakeries often give them away for free. Donated buckets may lack lids, but both buckets and lids are sold at hardware stores and online. Toilet seats that fit buckets can be purchased at camping stores or online. Or adapt seats from home toilets to fit. Hand washing is critical. Use of hand sanitizer and disposable gloves and wipes will help you conserve your emergency water supply for essential hand washing. Keep toilet paper, soap, bottled water disposable gloves, towels or wipes and starter bags of carbon material in a bucket. Nest in empty buckets that remain available for everyday chores. Designate one bucket for pee. This bucket need not be lined. A day’s worth of pee has 10 times the volume of poo. Pee is generally sterile while poo contains pathogens and requires special care. Not mixing urine and feces is a proven principle of ecological sanitation. In separating pee and poo, the twin-bucket toilet reduces disease risks and odor and makes the contents of each bucket easier to handle. Designate the second bucket for poo. Line this bucket with a garbage bag of appropriate thickness and quality – not a shopping bag for example. If you choose, you may put sand, sawdust, or kitty litter in the bottom of the garbage bag to absorb liquids. After each use, pour a disinfecting solution of 1 part bleach to 10 parts water into the garbage bag. This will help avoid infection and stop the spread of disease. Use twist ties to close the bags between uses, and close lid tightly. Wash your hands! The great thing about pee is that it’s clean (unless a household member has a kidney infection or blood in their urine). It poses almost no health risk. 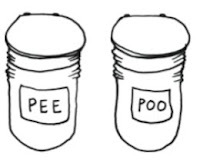 With extra buckets and lids, you can store pee until it can be sprinkled on land as a fertilizer. The poo bucket contains most of the pathogens. Poo needs to be treated, or contained until treated. But, the great thing about poo is that it doesn’t take up much space. Each of us produces only 4-10 ounces daily. It takes a couple of weeks for three people to fill a bucket with poo and carbon material. At the end of each day, the bagged waste should be securely tied and removed to a protected location, such as a designated garbage can in the garage, basement, or an outbuilding, until safe disposal is available. If the sewer is not working and your toilet bowl is empty, you can line your toilet with garbage bags and use it in the same manner. This has the added comfort advantage of using a regular toilet seat. Note: This waste cannot be disposed of with your regular garbage. Once the disaster is over, dispose of the waste according to directions from your local Health Department or Emergency Manager. Bury garbage and solid human waste to avoid the spread of disease by rats and insects. Dig a pit 2 to 3 feet deep and at least 50 feet downhill or away from any well, spring or water supply. If the garbage cannot be buried immediately, strain any liquids into the emergency toilet. If this alternate disposal method is used, you may elect to refrain from lining your poo bucket with a plastic bag. Wrap the residue in several layers of newspapers and store it in a large can with a tight-fitting lid. Place the can outside until it can be buried. • Locate the toilet away from food preparation or eating areas. • Provide a place next to the emergency toilet to wash hands that offers soap, water, and paper towels. • Keep toilet closed when not in use to keep out insects/animals and to prevent the spread of disease. • Supervise small children when they are using the emergency toilet. If your water is cut off, but the sewer system is still working, and if you have an auxiliary supply of water, you can flush your toilet by pouring 2-3 gallons of water into the bowl. If you are given prior notice of the water system shutoff, you could fill your bathtub or child’s wading pool with water for this purpose. You could also use water from a swimming pool or pond. Note: Water brought into the area for drinking purposes must not be used for this. Disclaimer: This information does not in any way guarantee or promise your safety or survival in any disaster or situation. This is for informational purposes only and is to be used at the discretion of the individual, family or group. Not all information or suggestions apply to all people and/or situations; people are encouraged to use common sense at all times.